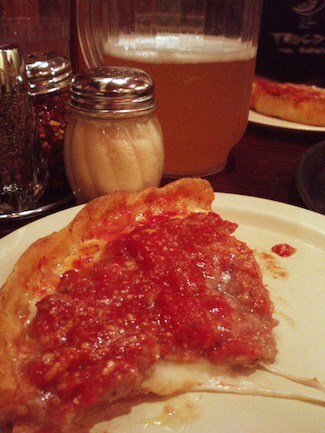 Finding your favorite deep-dish pizza chain in Chicago is a little like playing Goldilocks. You try one and it’s a little too dense; another is plagued by cardboard crust. It took me the better part of the year that I lived in the city to fully research the options, but I’ve pledged my troth to one kind above all others in the end. 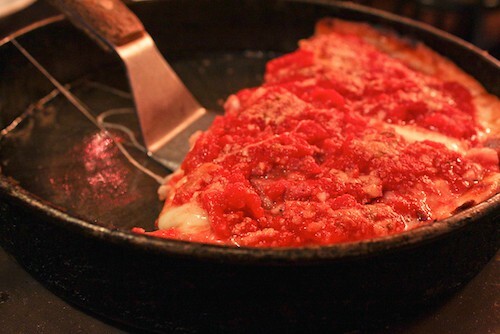 When anyone asks me which Chicago deep-dish pie is my favorite, I’m making the case for Lou Malnati’s. Let’s get one thing straight before we discuss. No one is eating deep dish for health reasons; it all comes down to taste. And personal preferences are just that—personal, like the largest size of layered, saucy, crispy pie I could possibly attempt to eat on my own without assistance from friends or family. 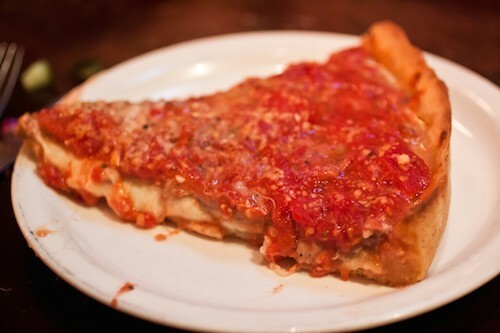 The anatomy of a Chicago deep-dish slice is such that you’ll cover all the major food groups in each bite. A high-sided moat of crust baked in a blackened high-sided pan is filled with gooey cheese, then layered with your choice of toppings, and finally slathered in tomato sauce (with extra Parmesan on top of that, if you’re so inclined). But within that template, there’s room for infinite variation. And that’s where I think Lou Malnati’s excels beyond its brethren. The sauce is fresh and clean, not overly spiced or too sweet. The mozzarella has a mild, salty tang, but doesn’t congeal too quickly. And its famous Buttercrust(TM, really) isn’t thick and puffy, nor is it thin and tasteless. The edges stay crunchy, the insides stay pliant, and it still supports the perfect ratio—the golden mean, if you will—of crust to cheese to toppings to sauce. The original location of Lou Malnati’s is up in Lincolnwood, but there are branches scattered throughout the city. 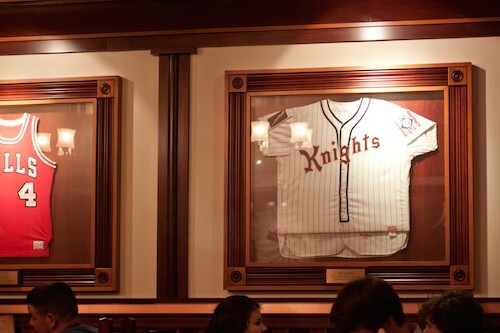 Every time Dan and I return to Chicago, we always end up in the outpost on N. Wells, where the walls are lined with jerseys from sports world greats both real and fictional—yeah, that’s a New York Knights jersey from The Natural in the photo—and the Goose Island Green Line flows freely. The Malnati Chicago Classic is our standing order: sausage, cheese, sauce, and Buttercrust, with a little extra garlic for oomph. I suppose you could round that order out with salad, but I come hungry and wait patiently for that searingly hot round of pie to arrive at the table. I would never discourage you from eating as much pizza as your heart desires or from sampling every kind of deep dish in the city in pursuit of your own golden ratio, but as far as I’m concerned, there’s only one name worth remembering in Chicago pizza. See you soon, Lou.